It’s a seemingly archaic law that prohibits consumers from burning or ripping music, movies or other digital content onto a personal computer, mp3 player, disc or the web. In an age driven by accelerating technology, online social networking and a prolific web presence, the concept of digital file sharing has become deeply ingrained in the habits of hip, savvy content consumers. Though punitive response is generally low for the crime of ripping content illegally, most countries recognize copyright laws that prohibit content burning. Happily for content consumers in England, the UK government recently made it legal to burn content from CDs to a computer or mp3 device for personal use, though ripping to DVD is still considered an illegal activity. DVD’s Technical Protection Measures (TPM) still outlaws copying film on DVD to a personal device. It is also still illegal to transfer files from person to person. Business secretary Vince Cable said the updated law was “not only common sense but good business sense.” He remarked that the law would increase respect for copyright laws by making them more realistic in the current marketplace, while still intending to protect content creators for their work. He said that this law strikes a good balance between allowing consumers to enjoy the music they have purchased, while not giving too much free reign to steal content from legitimate artists. Copyright laws are meant to protect the creative works of artists, but in this day and age, it can only be a good idea to compromise between the realities of the digital landscape in order to protect more serious copyright issues. Is it really so terrible to copy the content from a CD you actually purchased onto your own computer or mp3? Finally, the UK doesn’t think so. Other digital sharing activities like uploading files online for download without permission are still illegal, and there are still much bigger fish to fry than an innocent bit of content duplication. Mobile POS technology is a $5.5 billion industry worldwide, and it’s the fastest-moving retail trend since Internet was added to brick and mortar locations. It makes sense because in a world that’s on the go more than ever before, portable POS systems allow anyone from servers to corporate managers to take their business with them and complete transactions anywhere. Mobile POS systems generally connect easily to a smartphone and allow online transactions to be completed through a credit card slot. Now, Epson has added Bluetooth capabilities to their leading line of mobile Mobilink POS printers to make virtual transactions and printing receipts even easier. 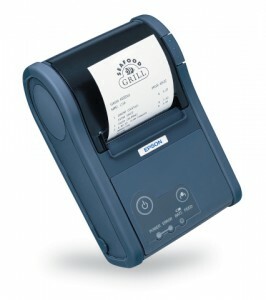 The Mobilink P60 Thermal Printers are compatible with all iDevices, including the iPad, iTouch, and iPhone. The wireless connection is through Bluetooth 2.1 + EDR wireless networking standard. The Bluetooth open wireless connection protocal makes connecting to the Internet safe, secure and reliable from practically anywhere. Mobilink is not just for Apple; Mobilink devices also support Android and Windows operating systems with options for Wi-Fi 802.11 and Bluetooth. Mobilink was originally launched in 2003 and is the leading mobile POS system for retail and hospitality environments. The device is perfect for efficient, high-speed, reliable POS printing with an autocutter and label peeler, depending on the version. Belt strap and shoulder strap options are also available.